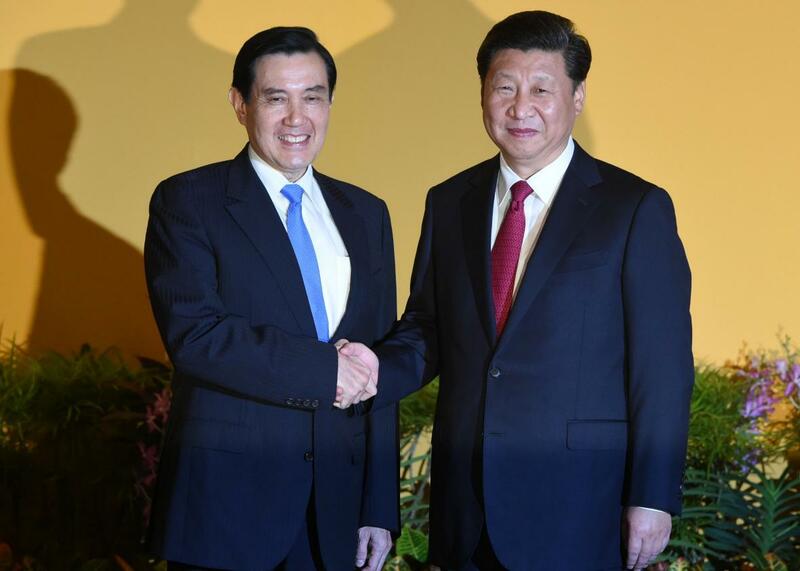 Xi Jinping and Ma Ying-jeou: Leaders of China, Taiwan shake hands. Taiwan President Ma Ying-jeou, left, shakes hands with Chinese President Xi Jinping, right, before their meeting at Shangri-La Hotel in Singapore on Nov. 7, 2015. It was all about the picture. Chinese President Xi Jinping and Taiwanese President Ma Ying-jeou shook hands Saturday in what was the first meeting between leaders of the two countries since China’s civil war ended in 1949. Meeting in a hotel ballroom in Singapore, the two leaders walked toward each other in front of a yellow backdrop. There were no flags due to China’s refusal to recognize Taiwan’s sovereignty, but there was symbolism everywhere. Xi, for example, wore a red tie, which is the color of the Communist Party, while Ma wore a blue one, the color of his Nationalist Party, notes Reuters. The two men knew the symbolism was what was important at a meeting that would produce no agreements, and so they shook hands for more than one minute, posing for the cameras. “Nothing can separate us,” Xi told Ma after the handshake, according to the Associated Press. “We are one family.” The Chinese president even got a bit poetic during the brief public comments before the closed-door meeting: “We are brothers who are still connected by our flesh even if our bones are broken.” Ma spoke of the need to “replace conflict with dialogue.” Neither referred to the other as president, choosing to simply address each other as “Mr.,” notes CNN. The last time communist and nationalist leaders met was in 1945, when Mao Zedong and Chiang Kai-sek held seven weeks of talks, points out the Guardian. The two were scheduled to have a “casual” dinner later. They were reportedly planning to split the bill.